Who would have thought a banana-salted egg combo would be so amazing? Your guests will certainly go bananas over these golden rolls of goodness, whether for breakfast, or as a dessert. Dice the banana and set aside. In a mixer add in all the ingredients expect evaporated milk and mix well. Once it forms a paste, slowly add in evaporated milk to get a smooth texture. Fold in diced banana and set aside. Preheat deep fryer to 180 degree Celsius. Wrap the banana salted egg filling with spring roll skins at 30gm each. Deep fried for 5mins till golden brown. 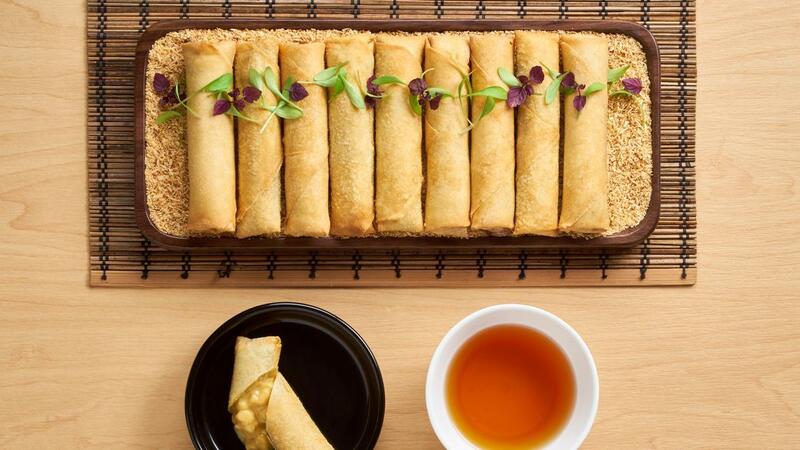 Lay desiccated coconut onto serving board and assemble fried banana spring rolls.